Faith and the Future Force is a great diversion from Faith's regular series. This time-traveling adventure to defeat a formidable history-gobbling robot has been Valiant's heroes' biggest challenge. It's led Faith to seek out the help of a villain to help turn the tide in their favor. Ever since the time traveler, Neela enlisted Faith to join her crusade to save the time stream and defeat the threat they've faced one defeat after another. Each time resetting the timeline in Groundhog Day movie fashion, reliving the same day over and over. It didn't matter who else they recruited to help - Bloodshot, Rai, Renegades, Ninjak - they were no match for Do-Bot and its clones. They would just absorb everything thrown at them and devour time and life as we know it. All seemed hopeless especially as Neela ran out of options and told Faith the state of the battle. With the use of superheroes exhausted, Faith decides to convince a villain to join the fight. Jody Houser has taken Faith to new heights by showing her leadership under this new threat. Faith has always been charming, positive, and brave but to have her put her faith in one of her rogues shows a lot of maturity. It leads to a surprising resolution of the series that may or may not satisfy everyone but it's totally in-line with the aspirational tone of the character and Houser's purview. The more I think about the ending the more satisfied I feel about it. The only negatives were the limited development of Neela and Ank. I didn't expect much from the plethora of Valiant heroes that only cameoed during an issue but Neela and Ank were present throughout the story. However, to be fair to the creators there's only so much that can be done in four issues. Cary Nord, Brian Thies, and Ulises Arreola handle the art duties and while there aren't consistently sharp or rigid line work the softer approach is expressive and laid out well. Arreola's colors are deep and rich adding a ton of depth to the page. It's a well-paced and colorful adventure that hits all the right notes. 'Faith and the Future Force' uses a familiar story technique and turns it into a fun and enlightening adventure. Faith is clearly the star here and as always shines with determination, grit, and smarts. If nothing else it really demands further exploration of Faith with Neela and Ank as a team than what we get here. It may not be a total home run but a solid stand-up triple. 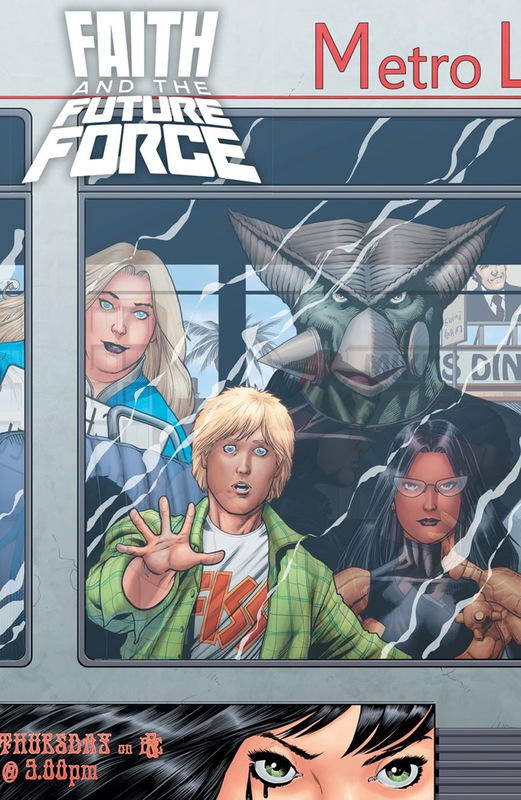 In other words, 'Faith and the Future Force' is worth the ride despite its limitations as only a four-issue arc.